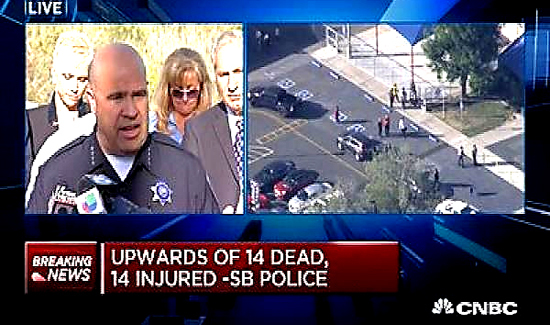 The latest carnage in California took the lives of 14 and left 17 others seriously injured. The shooters were a couple. The husband worked at the social services facility where the violence occurred. Both suspects were shot and killed by responding officers after police received a tip about the address of the culprits. Police identified the killers as Syed Rizwan Farook, 28, a county health department employee whose co-workers were among those slain, and Tashfeen Malik, 27, who authorities said was either his wife or girlfriend. Farook, who was born in the U.S. and had worked for the health department for about five years, left the party “angry,” according to San Bernardino Police Chief Jarrod Burguan. Burguan praised the response of his team. “That was flat-out heroic, what they did,” Burguan said. It’s unclear as to what the motive for the mass shooting was. The FBI is not ruling out terrorism, but considering the fact that one of the shooters was employed at the facility where the murders took place could point to a non-political workplace shooting. While there is some disagreement among statisticians about whether or not mass shootings are on the rise, there has been more than one mass shooting per day in 2015.